Dirk Johnson at Merle Wood & Associates sends in the news that his joint central agency, with Bruce Brakenhoff Jr of Perini Navi USA, has changed the currency and dropped the asking price of the 46.5m sailing yacht Antara. Antara was delivered by Perini Navi in 1991 and underwent a thorough refit in 2007, with a fresh interior, an extended flybridge with Jacuzzi, new paint, rigging and sails and new teak decks. 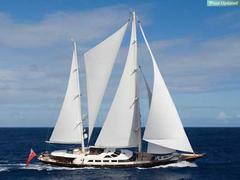 This superyacht accommodates up to 12 guests in a master, double and two twins plus four Pullman berths. Previously marketed at $20.95 million, Antara is now asking €13.5 million.